With the exception of door skins, shops should always use GM-approved impact-resistant structural adhesives in situations where glue is required, General Motors advised in a new GM Repair Insights article offering auto body shops tips for the adhesives. 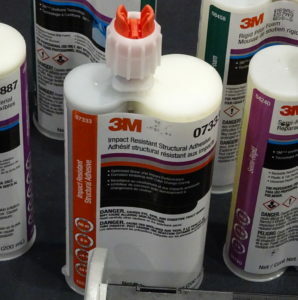 The OEM has approved four such adhesives, Ashland 5770P, Lord Fusor 2098, SEM 39757 and 3M 7333, according to GM Repair Insights, which reported that shops should follow the glue manufacturer’s recommendations too. The adhesives must be paired with a mechanical bond like a rivet, screw or spot weld — “no exceptions,” according to GM Repair Insights. Failure to follow OEM requirements on the adhesives could lead to grouchy customers, according to GM Repair Insights. The instructions seem to build on GM adhesive-and-spot-welding guidance announced at NACE 2017. General Motors had in previous model-year repair procedures permitted squeeze-type resistance spot welding and even encouraged shops to use it if possible. 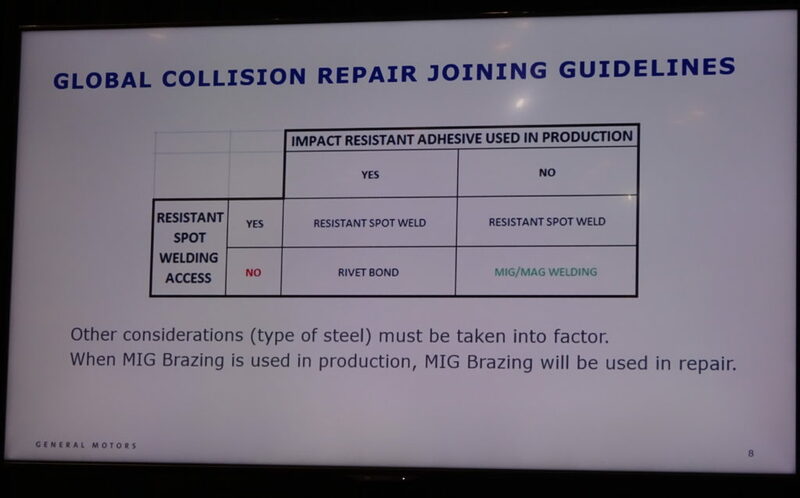 But from the 2018 model year forward, GM said then it planned to outright require repairers to use only squeeze-type resistance spot welding in situations where MIG plug welding had previously been acceptable. GM customer care and aftersales body/exterior aftersales engineering manager Jason Macco indicated at NACE 2017 the decision was in part prompted by minimizing heat exposure for the large amount of structural adhesive GM’s using in newer vehicles. Collision repairers should expect future welding and joining instructions to frequently follow the flowchart shown in the slide below, GM body structure service engineering advanced serviceability of design team leader Bob Hartman said then. The matrix is an internal GM resource the authors of repairer procedures use as a reminder when writing the actual instructions repairers will see in the manuals, according to Hartman. This by no means should be interpreted as the only four types of joining scenarios called for on future GM vehicles or a substitute for the actual OEM repair procedures. It’s just a guide. If impact-resistant adhesive was used in production and a resistance spot welder will fit in the joint, expect to apply adhesive and then squeeze-type-resistance-spot-weld the joint. If the tech can’t access the area with the welder, they’ll likely be using a rivet in conjunction with structural adhesive. If there was no adhesive used in the factory, the shop will still resistance-weld the joint but not use adhesive. If there was no adhesive used in the factory and the shop can’t get a resistance welder on the joint, then MIG/MAG welding will be allowed but no adhesive would be used. As noted before, exceptions will arise, making the actual OEM repair procedures, not these “Cliff’s Notes,” the true guide. Hartman explained that resistance spot welding over structural adhesive, which might seem counterintuitive to a layman, “actually makes the weld better.” Some of the adhesive will burn off — just as it does in the factory — but the overall joint will be improved and have better corrosion protection, according to Hartman and Macco.